Today, the recipients of the 2010 Library Creative Fellowships program and Ross Trust Playwrights’ Script Development Awards were announced. Family History Feast bookings now open! Vicnet has won the Best Diversity Initiative of 2009 in the inaugural Australia and New Zealand Internet Best Practice Awards. 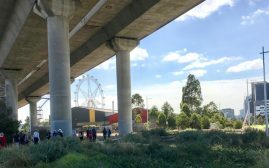 Dr David Sornig ponders the history of West Melbourne’s lost wetlands, and takes us on a collective journey around the area.